Randy has given us an interesting challenge tonight for Saturday Night Genealogy Fun. 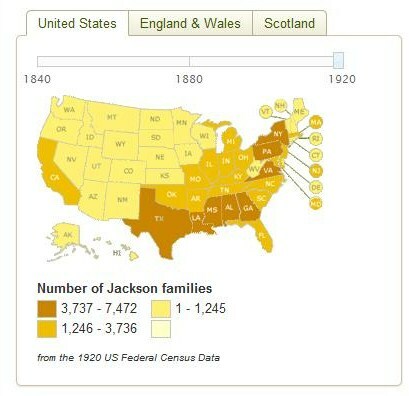 Go over to ancestry.com and try out their Surname Distribution Map app. 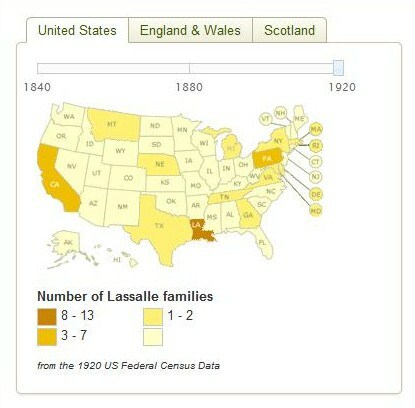 I’m going to use 1920 for all my maps since these people weren’t in the US before 1882 (and most came in the 1890s). I started with my own surname, Lassalle. This is my Dad’s side of the tree. French: variant spelling of Lasalle.Jewish: Frenchified spelling of Lossal, a habitational name from Loslau, the German name of Wlodislaw Slaski in Silesia. I don’t expect the distribution to be in many states because of the spelling which seems unique to the region of France my ancestors were from. But I am expecting California and Louisiana to be well covered. Will I be right? I was very close, wasn’t I? Not much that many families, were there? No wonder everyone always spells my surname wrong even when I say it really slowly for them. 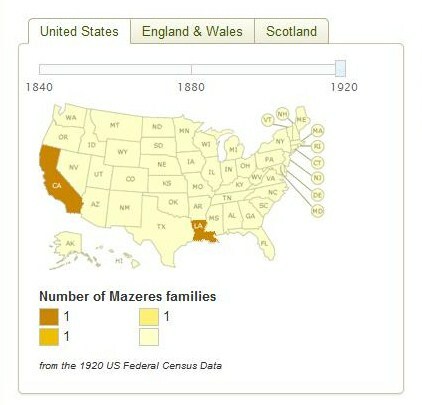 Next up, my Dad’s maternal side: Mazeres. This is an uncommon surname in the US. Again, I suspect California and Louisiana because of the French roots. There was no surname definition information for this surname. I am right! In fact, it only found two families. One in California which would be (my great grandparents?) and one in Louisiana. Now, let’s try my Mom’s side of the tree. First, I’ll do the Pacheco’s. I expect it to find my people in California and Hawaii, but I also expect their to be distribution across the country especially on the East Coast and in Massachusetts particularly. This is a Portuguese surname that also is rooted in Latino culture, so it should be located everywhere. Spanish and Portuguese: from a personal name of uncertain, possibly pre-Roman, origin. Interesting distribution. I thought Hawaii would be darker. English, Scottish, and northern Irish: patronymic from Jack 1. As an American surname this has absorbed other patronymics beginning with J- in various European languages. I tried a couple of other surnames: Breilh (2 families in CA–not surprising as my family seems to be the only one in the US using this spelling). DeBraga (found nothing, though de Braga pulled up something in Florida). 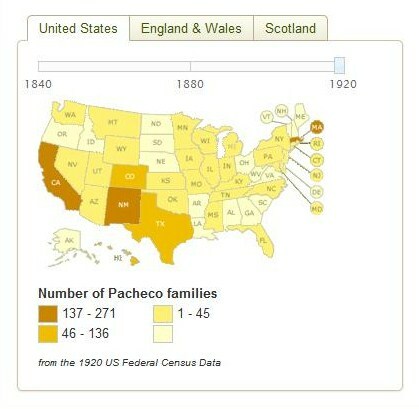 I also tried Algrava and Algarva, the surname many of the Pacheco’s took on after 1906. I think I broke it. LOL It didn’t find any. I find that interesting because there were probably more Algrava and Algarva than Breilh families in the US in 1920. I suspect the spelling didn’t work for this. This has been an interesting experiment!